Surrender at 20: 10/9 PBE Update: Experimental Preseason Changes, Singed Model/Texture Updates, New Splash Art, and more! 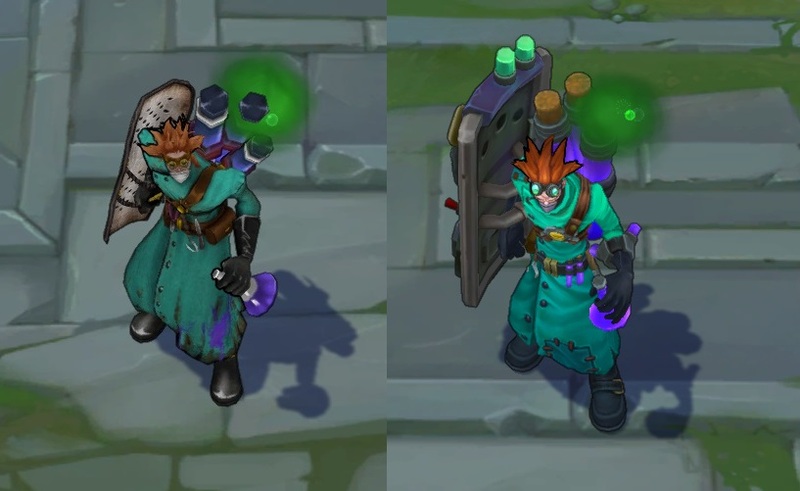 10/9 PBE Update: Experimental Preseason Changes, Singed Model/Texture Updates, New Splash Art, and more! 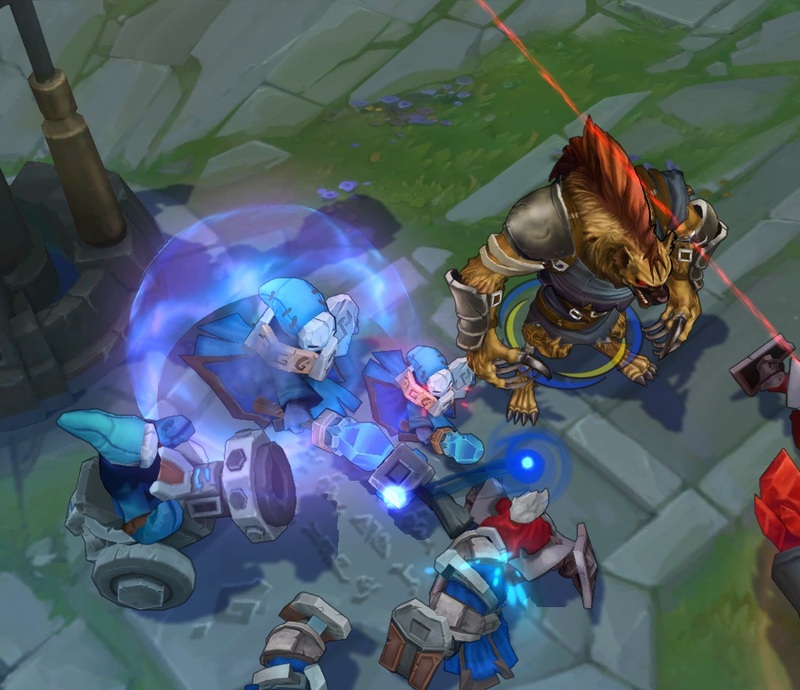 The PBE has been updated with a MASSIVE patch, including the first patch of experimental and highly tentative preseason changes! 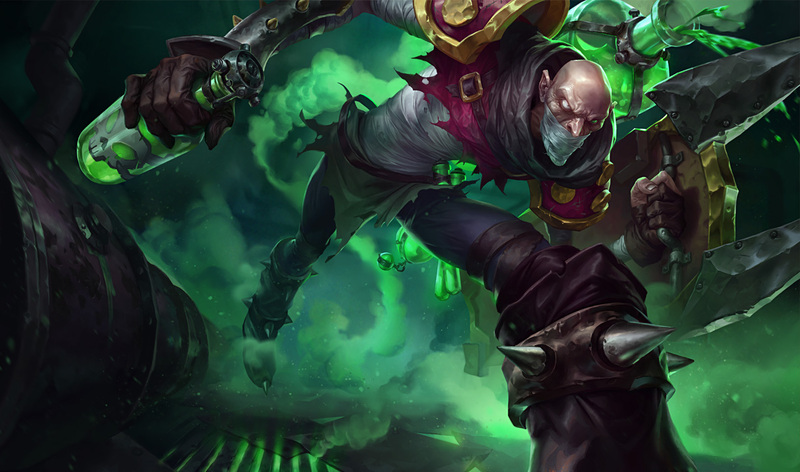 In addition to those, we also have new base splash arts for Singed and Udyr, model and texture updates for Singed and his skins, new 2014 ranked season summoner icons, Master tier reward assets, and much, much more! 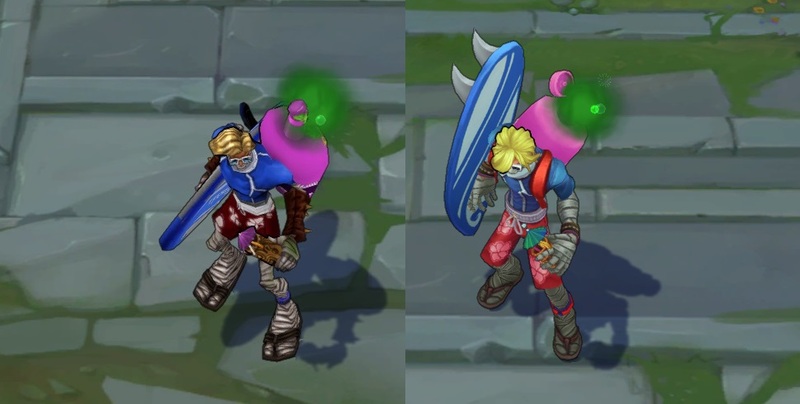 First up is base splash art updates for both Singed (who also received model and texture updates that you can find below) and Udyr! 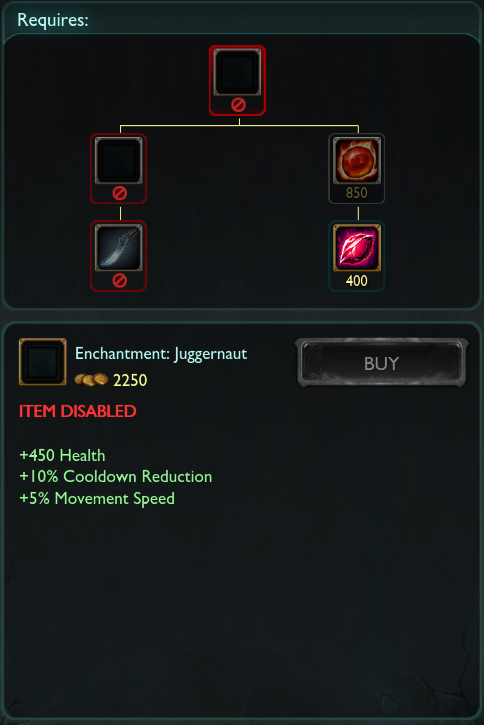 Here's SmashGizmo with context on a few Singed changes included in today's update we can expect to hit the PBE soon! 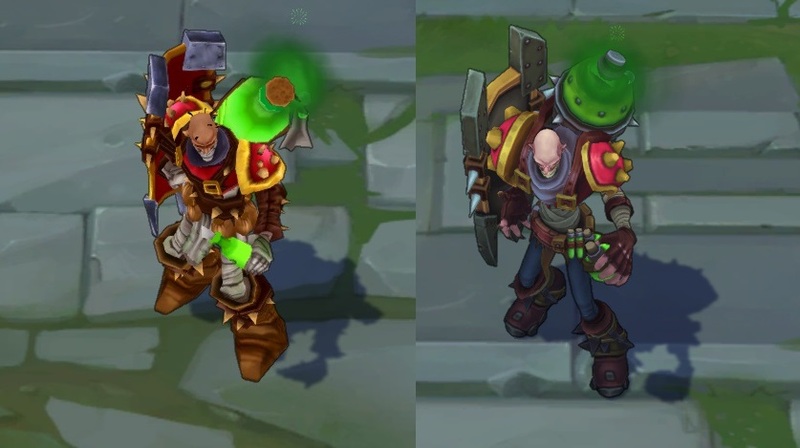 ... and here's a video preview and comparison of all of the updated Singed skins! With the ranked season ending on November 11th, the new 2014 Ranked reward icons have been added on the PBE! There is an icon for each rank and three icons for Challenger tier, for the "top 10,50/200 spots in solo queue as well as the top 3, 15, and 50 spots in team queues". 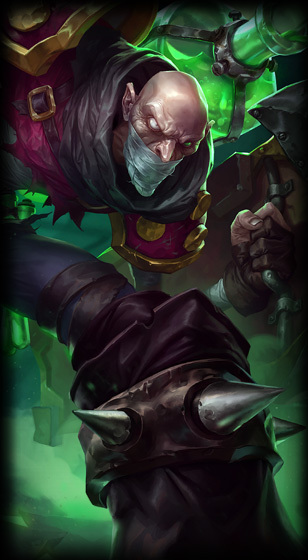 The ranked loading screen borders have also been updated to include the new MASTER tier border! 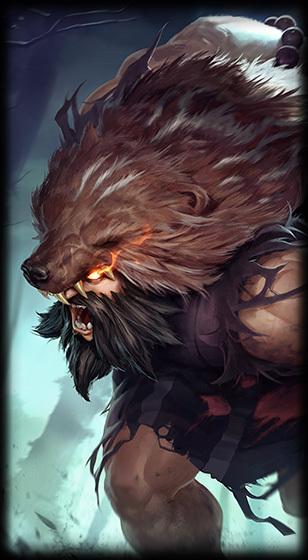 They've also added a banner trim for the new Master Tier! 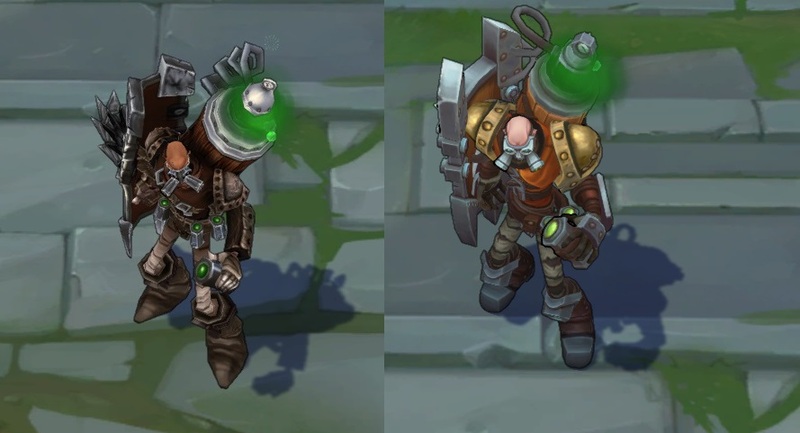 The first draft of the experimental preseason 2015 changes we've been reading about throughout the week are now up on the PBE for testing on it's own version of the SRU! First up, here is Xypherous with a set of rough patch notes for today's preseason updates. We are looking at a MASSIVE amount of changes so be sure to read through them carefully! Pushing to the PBE sometime tonight or tomorrow. Going to throw up a really rough changelist of the subtle stuff. I'm going to take the time to call out more subtle things that are harder to notice and give much less detail about the really obvious stuff. These are really rough patch notes and we are highly interested in heavily iterating on a lot of these. For example, I'd love to hear your suggestions for what cool Dragon bonuses could be - and I know we're still heavily iterating on the Jungle. I'm going really light on context in this post because this isn't an official patch notes - I just wanted to get a good list of details out there so you guys have some inkling of what's going on when the stuff gets deployed to PBE. As usual, if you have questions, feel free to ask but try to keep it in this thread if possible. 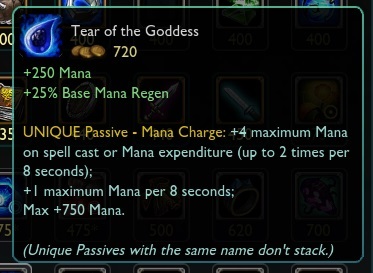 Fountain Regeneration now heals for 25% of the amount healed on live but ticks 4 times as fast. Roughly, characters will start the game with an additional 68% of their per level statistic compared to live. Each level, characters will gain from 72 to 128% of their per level statistic compared to live, totalling to 1700% of your per level statistic. Kill gold is no longer reduced before 4 minutes. Gold gained from Assists now scales from 25% to 50% over the first 210 seconds of the game. Death Timers now increase by 2% every 30 seconds starting at 35 minutes, rather than 2% every 60 seconds starting at 25 minutes. Towers no longer gain Armor and Magic Resistance over time, but they still gain Attack Damage. Tower Armor and Magic Resistance have been normalized to 100. Inner Towers have a shield protecting them that regenerates after 60 seconds of not taking damage. While the shield holds, nearby champions gain a moderate shield as well. 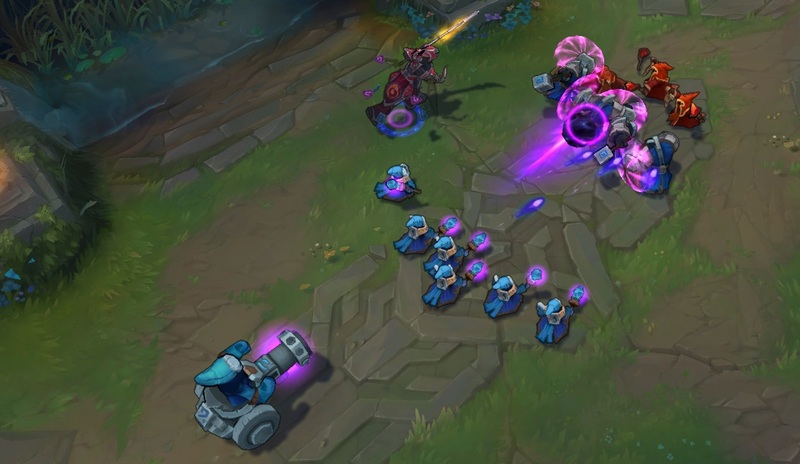 Inhibitor Towers attack their target continuously, up to 4 times a second. Inhibitor Towers slowly ramp their damage from 100% to 260% over the course of 6.5 seconds. Inhibitor Towers slowly ignore their targets armor from 40% to 100% over the course of 6.5 seconds. Ramp is reset when Inhibitor Towers change targets. Minions gain increased maximum Health at a rate roughly comparable to the old resistance bonuses such that their effect HP is the same. While a character is in their own base, they receive a movement speed and minor resistance bonus. Inhibitors respawn timers increased to 300 seconds from 240. 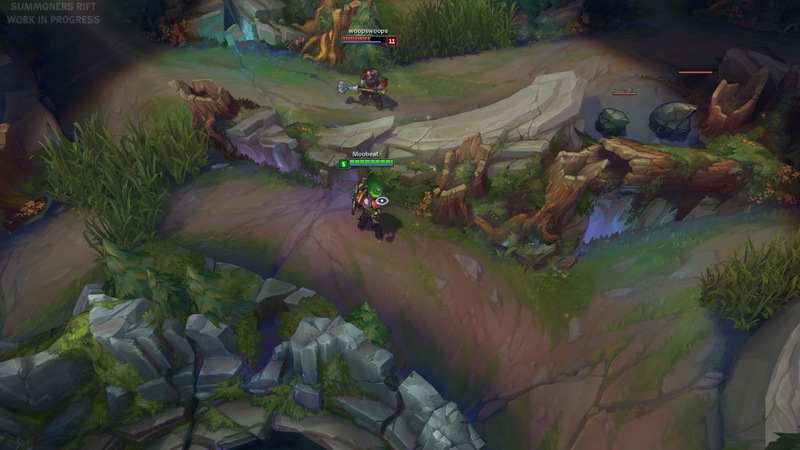 Blue Buff duration reduced to 120 seconds from 150. Grants you 1% of your maximum Health every 5 seconds. Duration reduced to 120 seconds from 150. In the top and bottom lanes, at the entrance to river, a powerup will spawn beginning at 20 minutes and every 3 minutes thereafter. +50 out of combat movement speed. Standing Still for 0.5 seconds grants up to 25% increased vision range and the ability to look over walls. Elixir of Fortitude and Brilliance have been removed. You may only benefit from one elixir at a time. Elixirs may only be bought when your champion is level 9 or above. Elixir price increased to 400 gold. 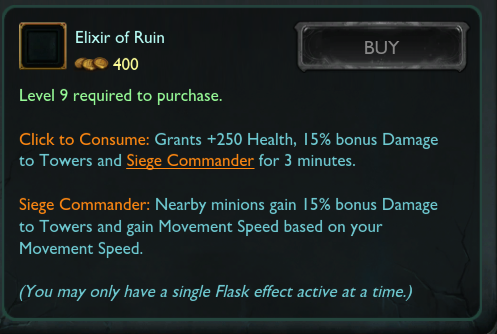 Elixir of Ruin: Grants Health, +% Tower Damage. Nearby minions gain +% Tower Damage and their movement speed is set to 90% of your own, up to 500. 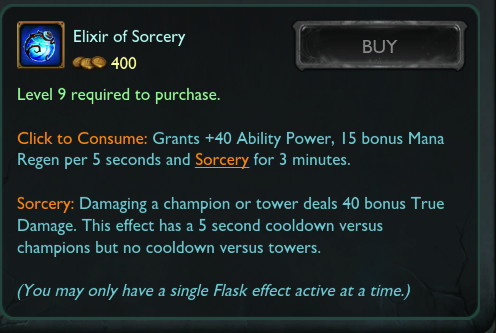 Elixir of Sorcery: Grants AP, MP/5 and bonus true damage when damaging a champion or a tower. 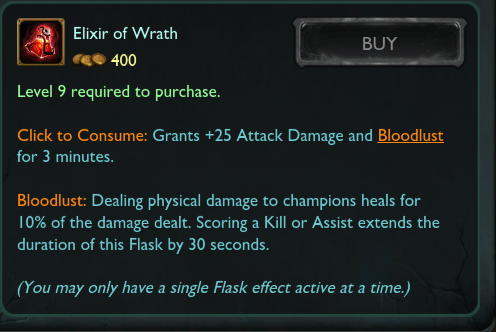 Elixir of Wrath: Grants AD, 10% physical vamp and scoring a kill or assist will extend the duration of the flask by 30 seconds. 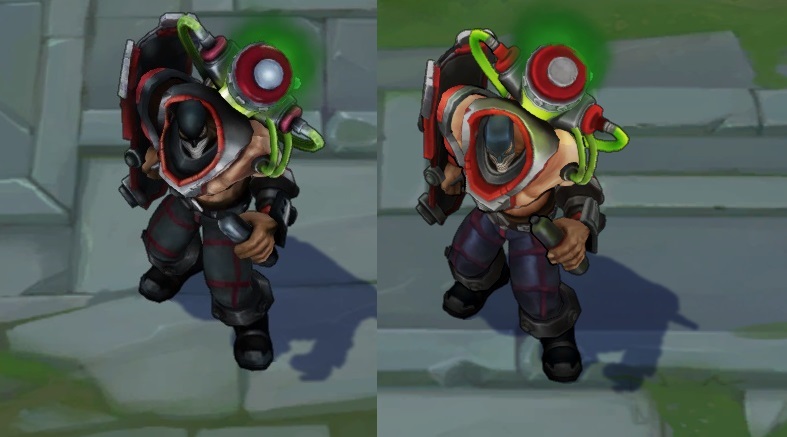 Baron Buff additionally grants you Empowered Recall, reducing your recall time to 4 seconds. This also massively heals you and grants you an 8 second movement speed buff once it finishes. Ranged Minions: Gain increased damage and a minor increase in range. Siege Minions: Gain massive increases to range - such that they outrange towers. Their attacks are 50% slower but are AoE and deal 4x damage to towers. Super Minions: Gains 75% Movement Speed when nearby enemies as well as 25% Attack Speed. Slaying Dragon now grants you a stack of 'Dragonslayer' which grants different permanent bonuses depending on how many Dragons you've slain. Dragon gives 50% reduced XP, compared to live. Dragon no longer grants global gold. Dragon deals 20% increased damage to units for every Dragon their team has slain. Dragon takes 7% reduced damage from units for every Dragon their team has slain. All Armor and Magic Resistance items can now be built out of a cloth armor / null magic mantle. Recipes, gold costs, stats and build paths have been adjusted to compensate for the above change. In effect, there is now no meaningful difference between 'Chain Vest/Negatron Cloak' items vs. 'Cloth Armor/Null Magic Mantle' items as they will all build from the same root. We're swapping from items granting flat HP/5 and MP/5 to increasing a % of your base regeneration + % level regeneration. This allows different characters to benefit from regeneration items differently - as well as allowing these items to more naturally scale as the game goes on. % Base Health / Mana Regeneration take into account your champion's Health and Mana regeneration and any Health and Mana regeneration they gain per level. 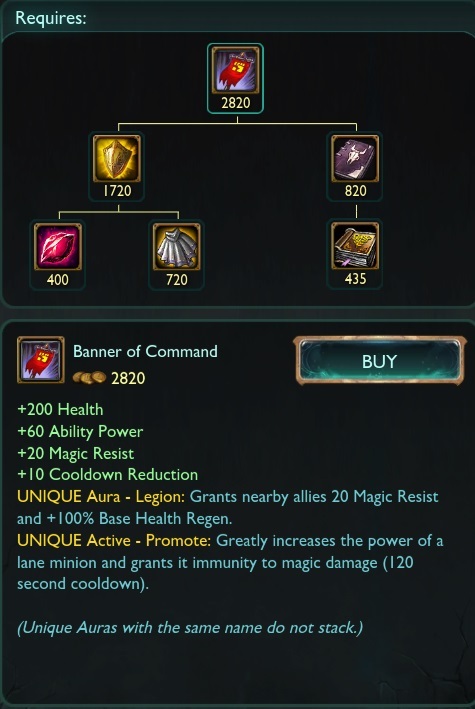 This does not take into account: skills, masteries, runes and other sources other than your champion statistic. Example: Your champion has 7 mp/5 at level 1 and 18 mp/5 at level 18. 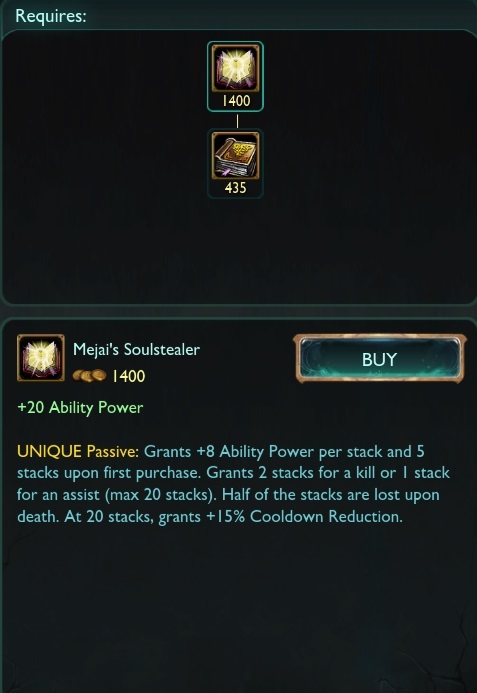 You buy an item that grants +50% Base Mana Regeneration. At level 1, this item will provide an additional +3.5 mp/5 at level 1 and 9 mp/5 at level 18. Active: Grants +60% MS to you and nearby allies when moving towards enemies for 2 seconds. When this speed boost ends, it emits a shockwave, slowing nearby enemy champions by 80% for one second. Health reduced to 800 from 1000. Regeneration triples when out of combat. 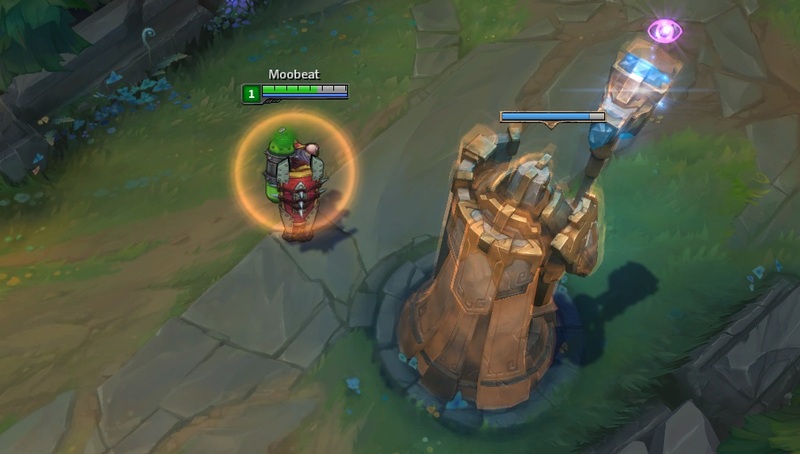 Grants bonus movement speed when near turrets or Zzrot Gates. Spawns a gate at a location that summons monsters. These monsters proceed down the nearest lane and attack minions and damage towers. Edit: Not currently in this build. Also no one spells like that. Active now boosts the damage of nearby towers by 100% or prevents nearby enemy towers from attacking. Jungle is different now. For reasons! 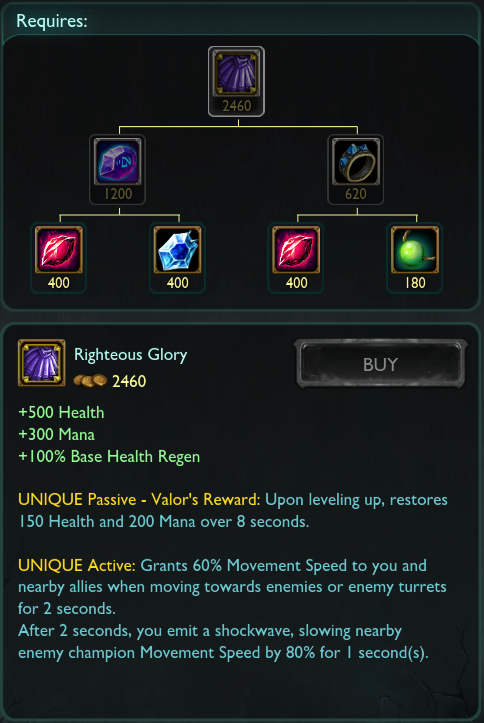 Reasons that are outlined in the previous PBE post. Don't look at me like that. Spawns in top and bottom river and patrols the river it is in. Is not hostile - tries to run away from enemy champions. Grants a speed shrine in the river that provides vision and out of combat movement speed to people who cross it. Restores a large amount of Health. Restore a large amount of Mana. Grants Gift of Heavy Hands - adding Execute Damage to your attacks. Grants Gift of the Toadstool - grants Toadstool Armor, poisoning enemies that attack you. Grants Wolf Sentry - A ghostly wolf patrols that quardrant of the jungle for a moderate time. 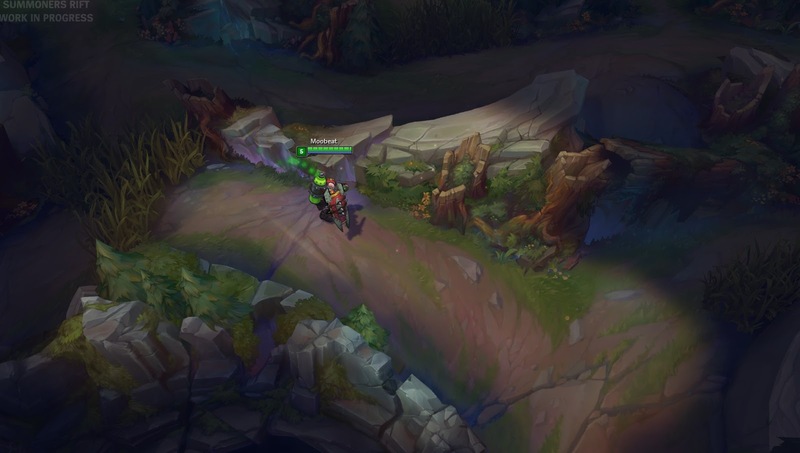 If an enemy champion enters that quadrant of the jungle, it'll run at them and alert you to his position. 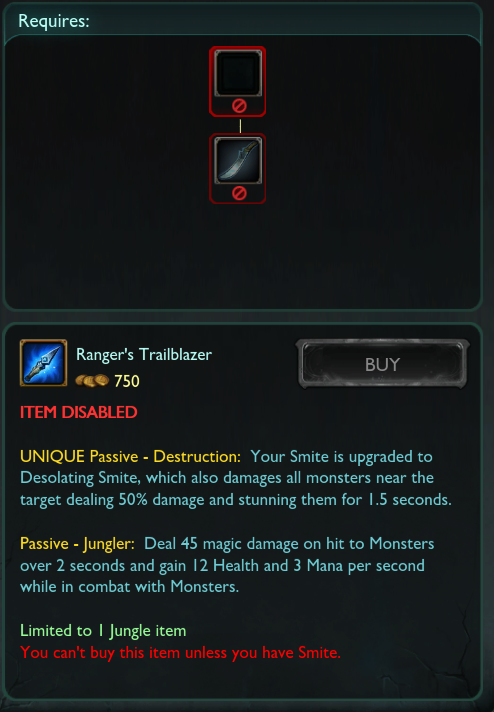 Jungle itemization has been overhauled - all existing jungle items have been removed. Hunter's Machete now grants 30 magic damage on hit over 2 seconds and grants 8 health and 2 Mana per second while fighting monsters. 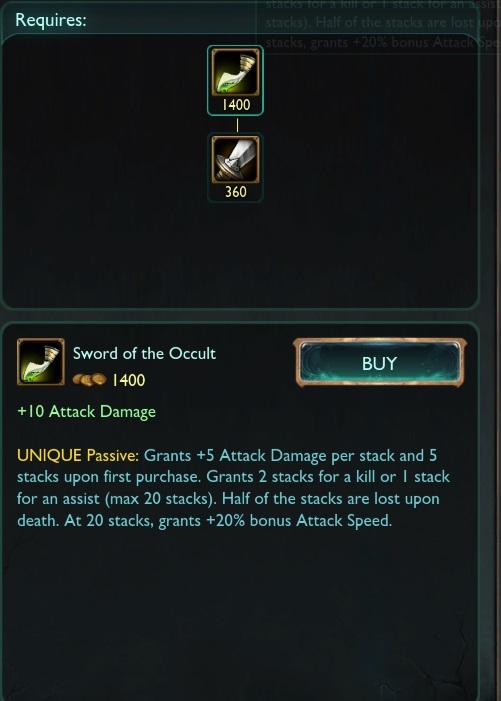 Hunter's Machete can only be bought if you have Smite as a Summoner Spell. After killing 3 monsters, you can smite enemy champions, dealing a small amount of true damage and reducing their movement speed by 50% for 2 seconds. Upgrade Smite to Quick Smite. 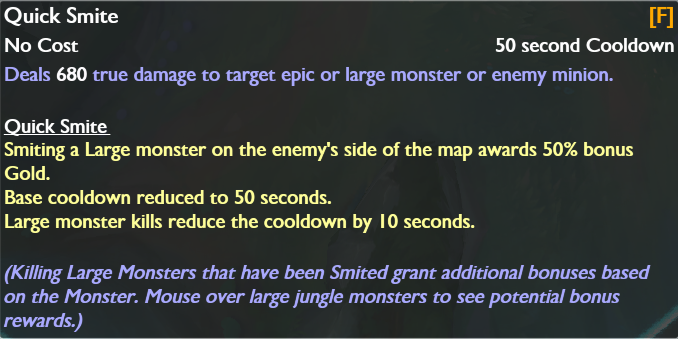 Quick Smite has reduced cooldown - has further reduced cooldown when you kill large monsters and grants bonus gold if you use it on the monsters in the enemy jungle. 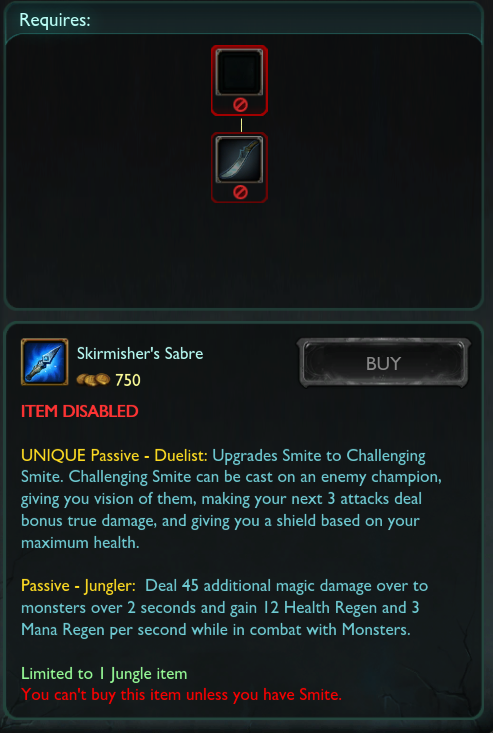 Upgrades Smite to Challenging Smite. 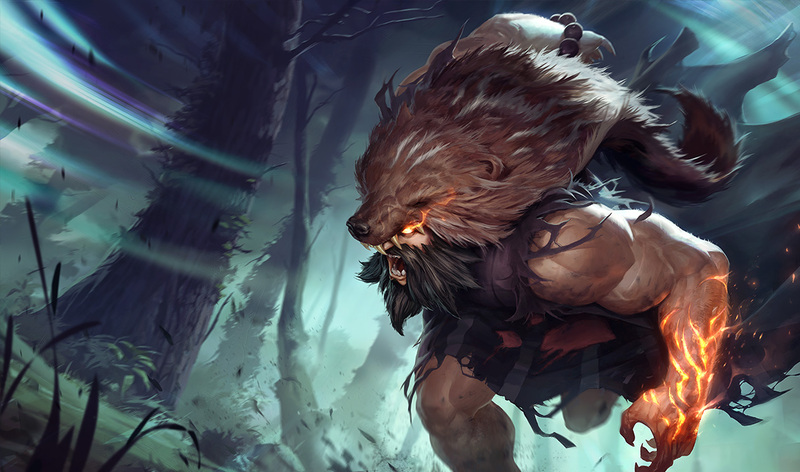 Challenging Smite can be cast on an enemy champion - doing no true damage but revealing them for a long time and causing your attacks to deal bonus true damage each time you hit him. Upgrades Smite to Desolating Smite - which causes Smite to deal 50% splash damage to other nearby monsters as well as stun them for 1.5 seconds. * Grants AS, CDR and a stacking AS buff"
Now that you've read over Xypherous's massive set of rough notes, here's a set of supplemental screenshots and additional information on the changes. PLEASE REFER BACK TO THESE ROUGH NOTES IF YOU ARE LOOKING FOR MORE SPECIFICS! Remember that EVERYTHING BELOW IS EXPERIMENTAL AND SUBJECT TO CHANGE! 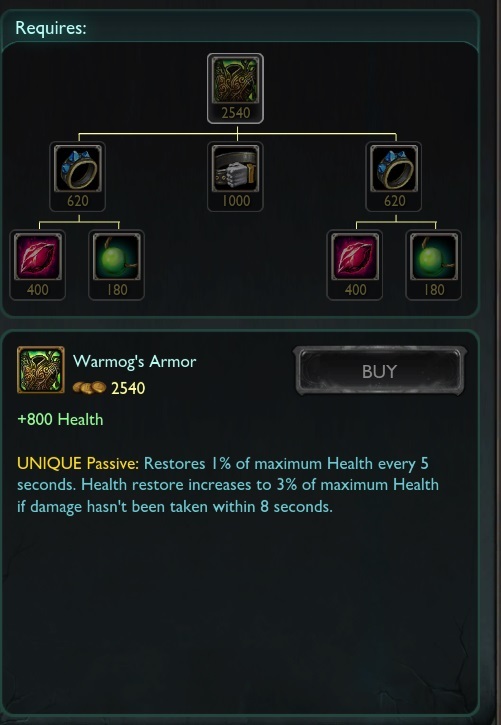 Inner towers now have a shielding mechanic that regenerates after 60 seconds of not taking damage and grants nearby champions shields. 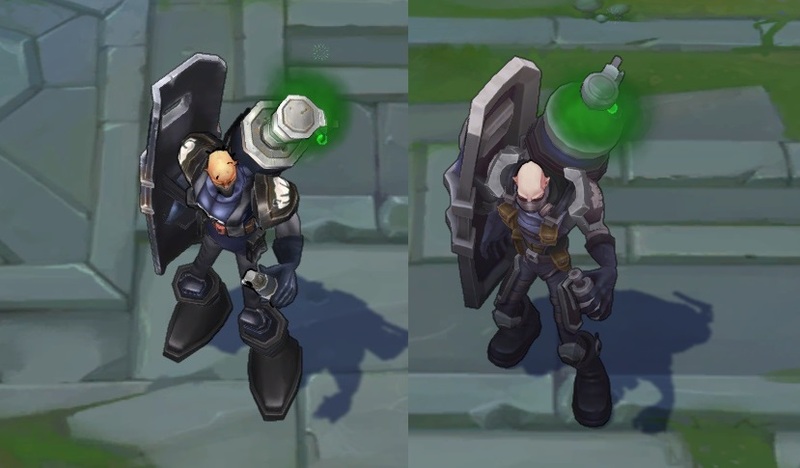 Inhibitor towers have a new beam mechanic that fires a continuous beam that increases in damage and armor pen the longer it is attacking the same target. 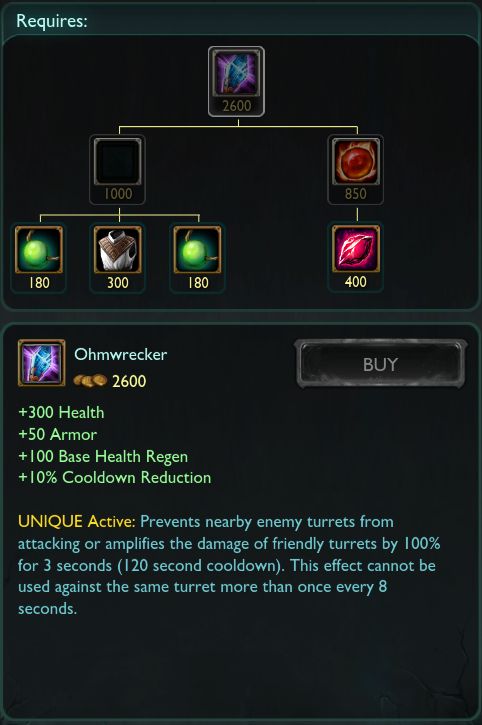 Still Waters is a new relic type buff that spawns on top and bottom after 20 minutes. After picking it up you get a movement speed boost and, When standing still, greatly increased vision! Dragon's reward system has been reworked to a "Dragonslayer" buff that grants a chunk of stats and becomes stronger the more dragons your team slays! Although taking the buff won't come as easy! In addition to taking 7% reduced damage from units for every dragon their team has slaim, Dragon also DEALS more damage to repeat slayers! 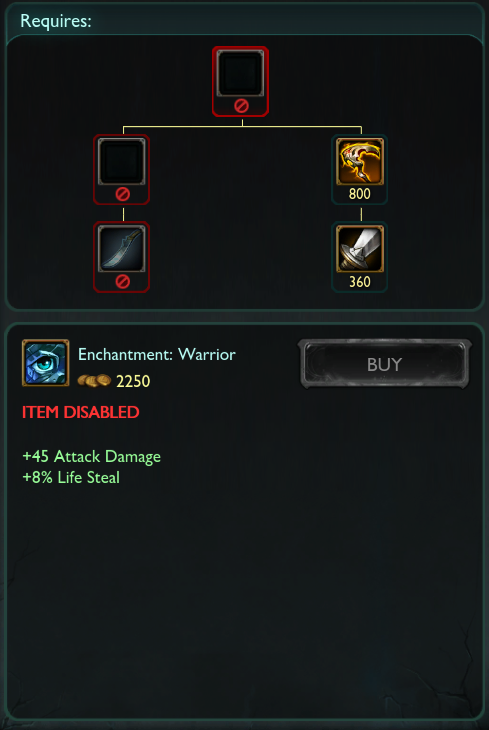 As mentioned in the rough notes, Baron buff now empowers near by minions iwth bonus stats! Melee Minions take less damage, Ranged minions gain extra damage and range, Siege minions get a massive increase to their range and have slower AoE attacks, and Super Minions gain movespeed and attack speed. Using smite on monsters in the jungle now gives champions unique bonuses when they kill it! Razorbeaks grants a buff that "Alerts and gives unit magical sight. 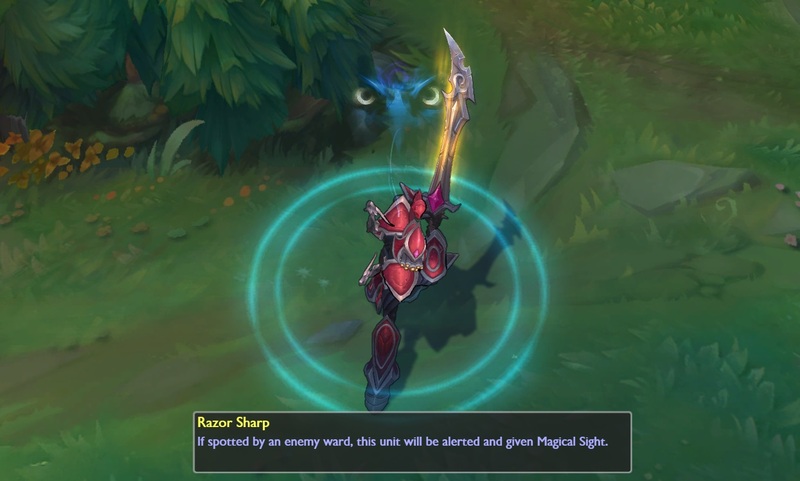 If spotted by an enemy ward in the next 60 seconds". 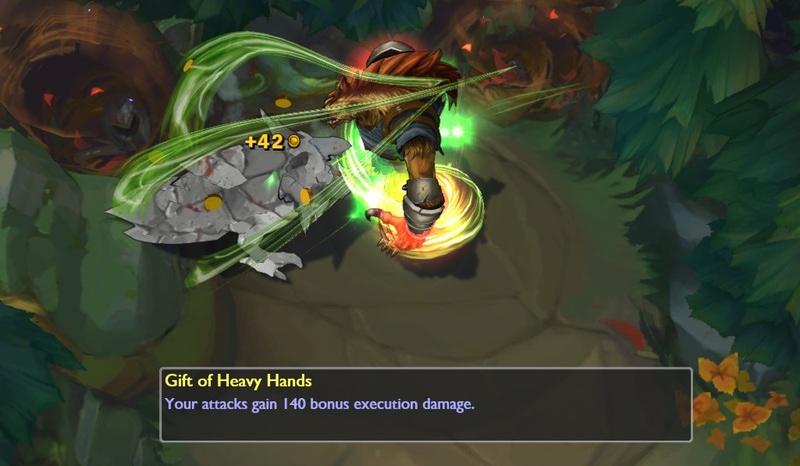 Gromp grants "Posion armor that damages an enemy that attacks the owner for 90 seconds"
Krug grants "Gift of the Heavy Hands" which adds bonux execute damage to your attacks and turns slain enemies to stone! Finally, Murkwolf "summon a ghost wolf that patrols the nearby area for up to 90 seconds"
There is also a new monster camp in the form of a roaming "Giant Enemy Crab" (who has a placeholder art to look like a wraith) who runs away from champions and grants a Speed Shrine when slain! The Giant Enemy Crab runs to in front of Dragon or Baron to lay down the speed shrine after being defeated. 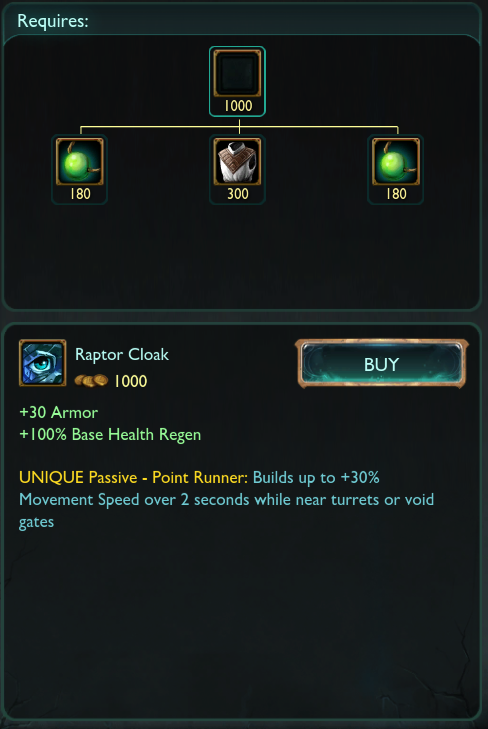 Here are a set of completely new items currently testing in preseason - Crystalline Bracer, Raptor Cloak, and Righteous Glory! 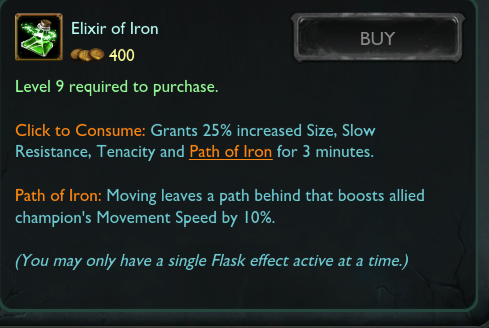 We also have four new Elixirs that offer powerful temporary and strategic buffs! 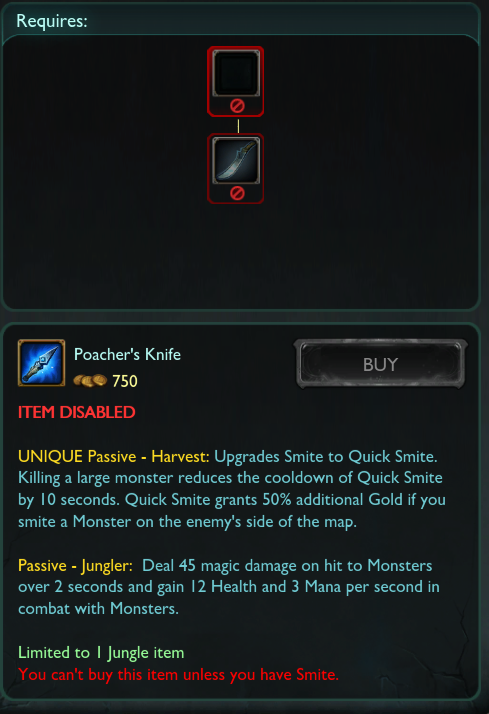 The old jungle items have been replaced with upgrades that build directly out of Hunter's Machete! 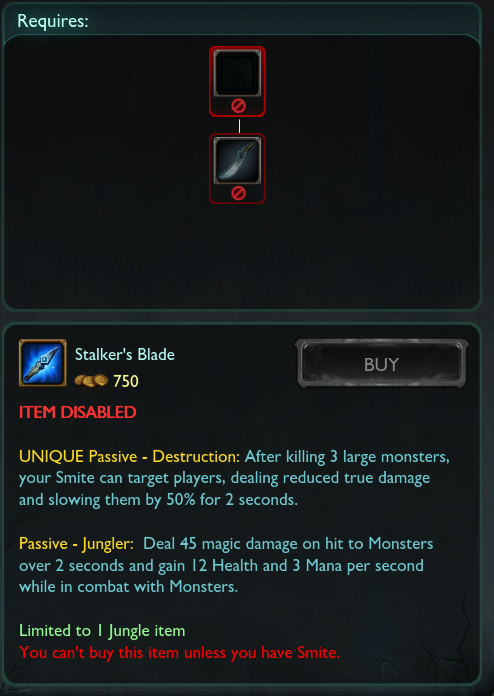 Each one offers the same "Jungler" passive aand it's own unique improvement to Smite. Each of the above items also comes with it's own variation of smite! Desolating Smite is currently not updating Smite's tooltip correctly. Each one of the Hunter's Machete upgrades can also be combined with items to be enchanted! The "blank" box is where any of the new Machete upgrades go. 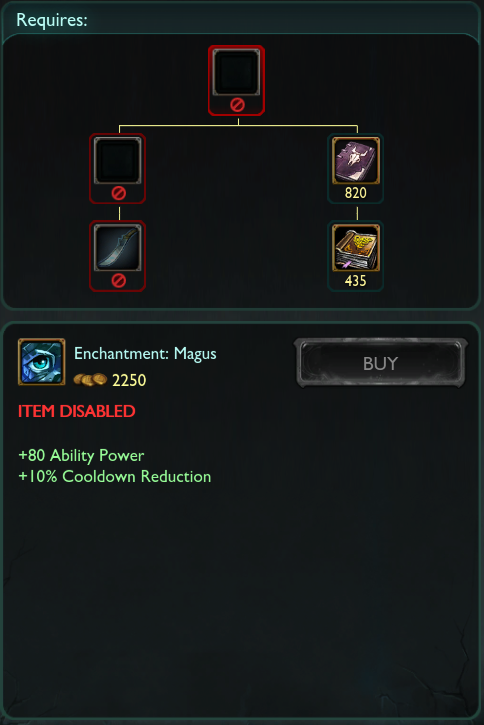 Basically you pick your upgrade, then combine it with one of the other items to form the new enchantment. For example, say I have a Stalker's Blade and I want the Juggernaut Enchantment. I combine my Stalkers Blade with a Kindlegem and some gold. 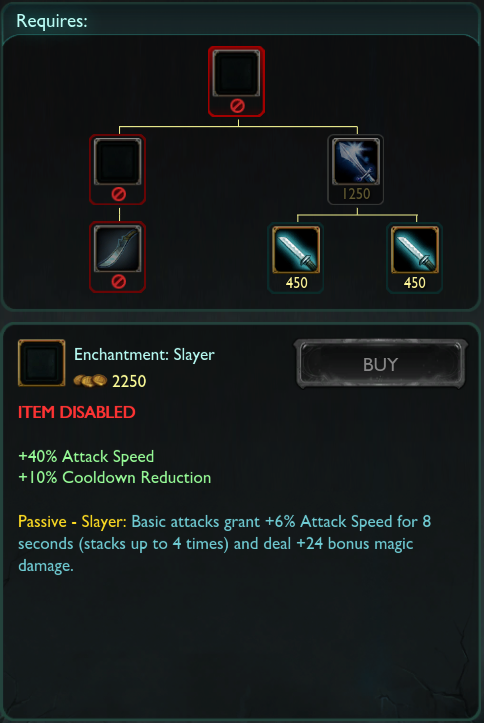 Or I could take my Stalker's Blade and mix it with a Vamp Scepter + gold to get the Warrior enchant. 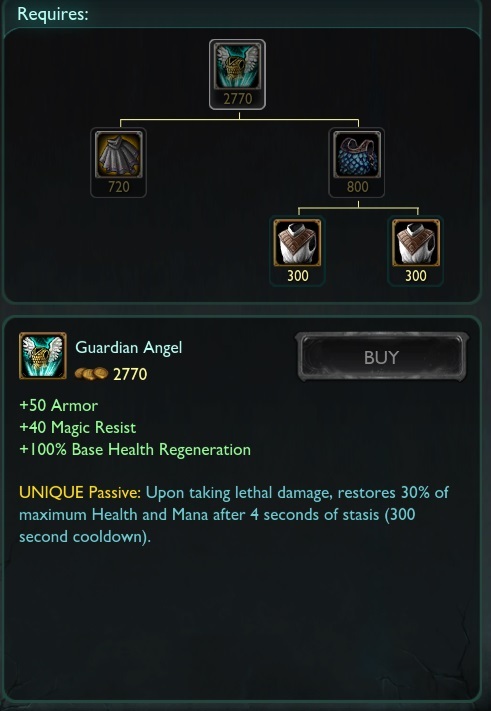 EVERY item with mana and health regen has been changed as mana and health regen is now +% of base regen instead of a flat value per 5. Smite now has indicator on the ability bar to show just how much damage it will do. As Xypherous mentioned, there is also a new "Homefield Advantage" buff granted when champions are in their own base. Attack Range increased to 550 from 525. Blinding Assault (Q) blind duration lowered to 1.1/1.2/1.3/1.4/1.5 from 1.5 at all ranks. Tag Team (R) significantly changed. First Cast: Valor replaces Quinn on the battlefield as a mobile melee attacker. Valor can move through units and gains +80/100/120% Movement Speed, decreased gradually to +5/10/15% when in combat. Second Cast: Quinn returns, replacing Valor on the battlefield, and also resetting the cooldown on Heightened Senses. 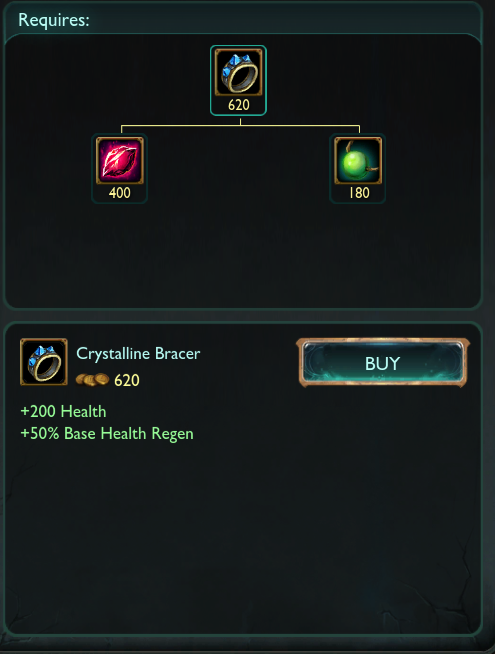 As the item changes are all relative to PRESEASON, I'll be including them up there with the other preseason info. 10/8 PBE Update: Reaper Soraka, Victorious Morgana, J4 and Rengar splash art, and more!